Happy New Year! Here's to a fantastic new 2012 and for a lot of us, a new year of Project Life!! I'm very excited to be a member of Becky Higgins' first Creative Team. Please be sure to check out the other team members' blogs for more inspiring Project Life posts. You can also find links to their blogs and the PL product lineup at the left of my blog. This will be my 4th year for Project Life(the 1st year was Becky's original kit). For me it's the perfect way to capture the every day moments of my family and preserve those memories in a manageable way of scrapbooking. As I complete each weekly layout, I just smile a little inside. Knowing that each photo, each day, each week, and each month will be compiled into a wonderful album filled with all the little moments my family has shared....well, it's just a priceless treasure. Working on my Project Life pages is so rewarding for me. I get to fulfill my love of photography and scrapbooking while reliving all the little moments and memories. My little family is growing up. These are the days. The days I want to remember forever. Not just the big events like birthdays, holidays and graduations but all the little day to day moments in between. 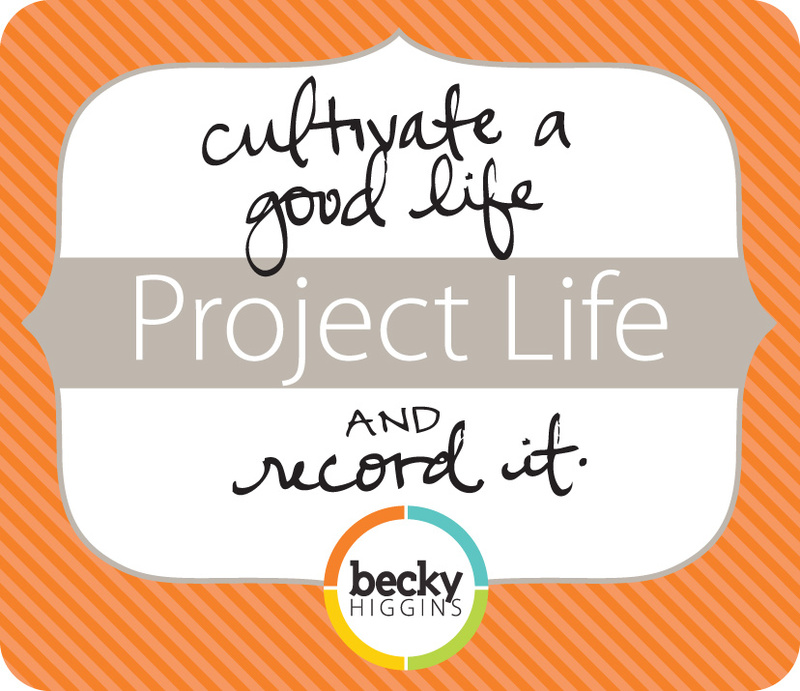 I'll hope you'll join me again this year as I share my love of Project Life with you here on my blog. Just so you know my method for Project Life, I use the photo a day approach mostly. I try to take a photo a day and sometimes it works out that I just have a collection of photos for one week. These all go into a weekly Project Life layout with a few additional page protector inserts here and there. I use Photo Pocket Pages with Design A for my basic layouts but I'm excited to work in all the types of photo pockets this year for some variety. Here's the entire collection of Project Life products. You can purchase them through Amazon by clicking on the links. This year I'm excited to get the new Clementine Core Kit but I'll be mixing in items from all of the kits here and there, along with some of my own products from my stash. Here's a sample below of a typical Project Life week from my album. 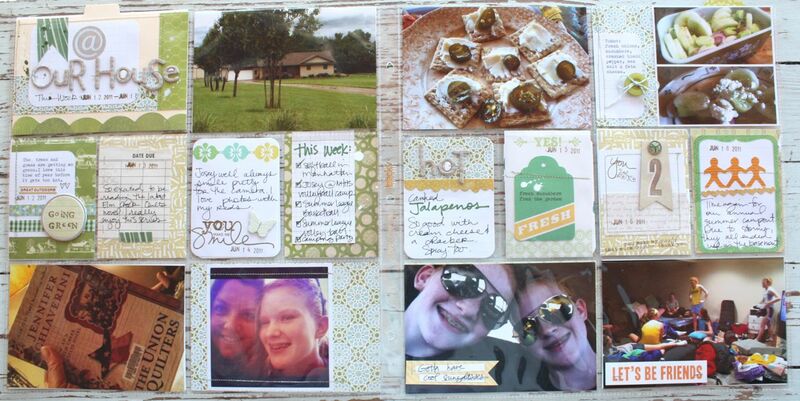 This is the majority of the scrapbooking I do so I like to get scrappy with my layouts. I like to treat each insert space as if I'm doing a mini scrapbook layout, with all the spaces coming together to form what looks like a modified, traditional 2 page spread with 12 x 12 pages. 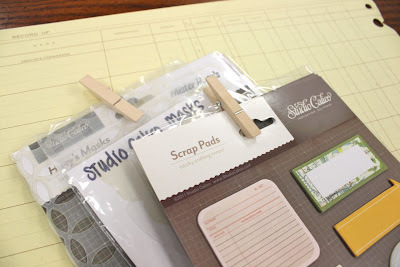 This method totally gives me my scrapbooking fix. Here and there I'll add in some more traditional scrapbooked pages. 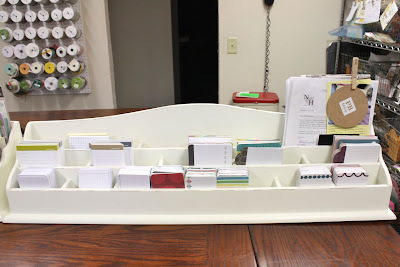 A while back I showed a snapshot of small portion of my Project Life organization. Since then I've had lots of requests for full photos of my work space + a listing of my favorite supplies to work with while creating Project Life layouts. So here we go....it's a long post because I decided that I'll just add everything I want to share in one post for easy reference. This is a shot of my craft room work spaces. My room is compilation of about 15 years worth of crafting supplies and various organization items. 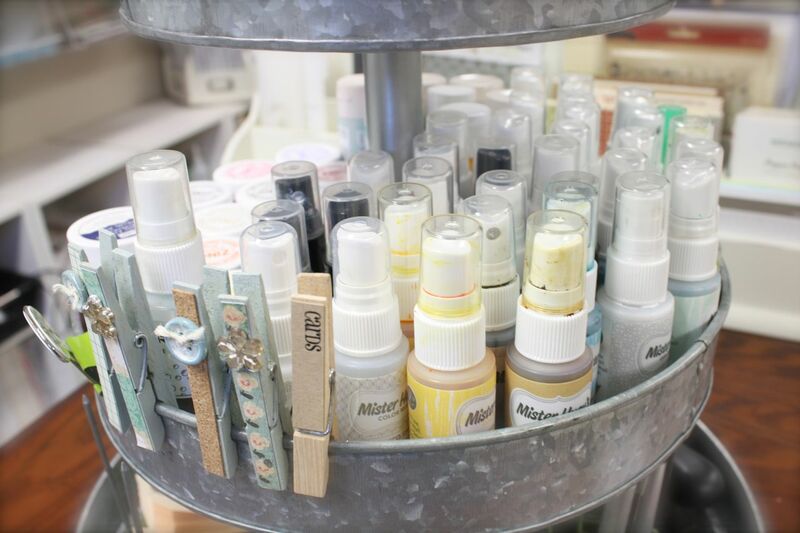 It's a total mish mash of products that I'm always rearranging, purging, replenishing and organizing. I have 2 standing height tables that I use for various tasks. 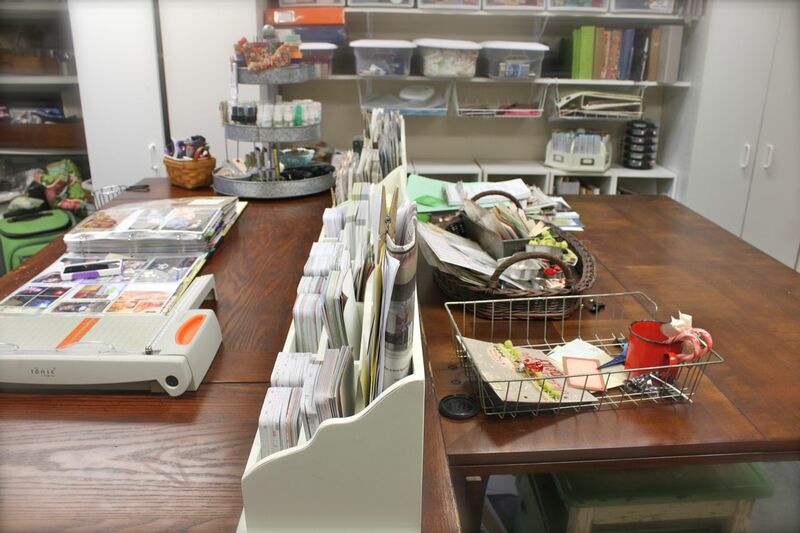 The left table shown below is where I work on all my projects including Project Life, stamping and other crafting. The right table is where I work on special projects like my Daily December album, Etsy kit assembly, packaging, and sorting. One table is a yard sale find and the other was a cast off from my FIL's business. Below I'm facing my Project Life work table. This is where 99% of my work gets done. The two off white divider units are the ones you've all been asking about. Each unit is 36" long. I got them years ago on clearance at Pottery Barn Kids. I believe they were intended for dressing table organizers. They're now discontinued...I did a lot of research trying to find something similar to link to but didn't have much luck. I did find some nice units from The Container Store that will maybe spark some ideas if you are researching Project Life storage for your own needs. 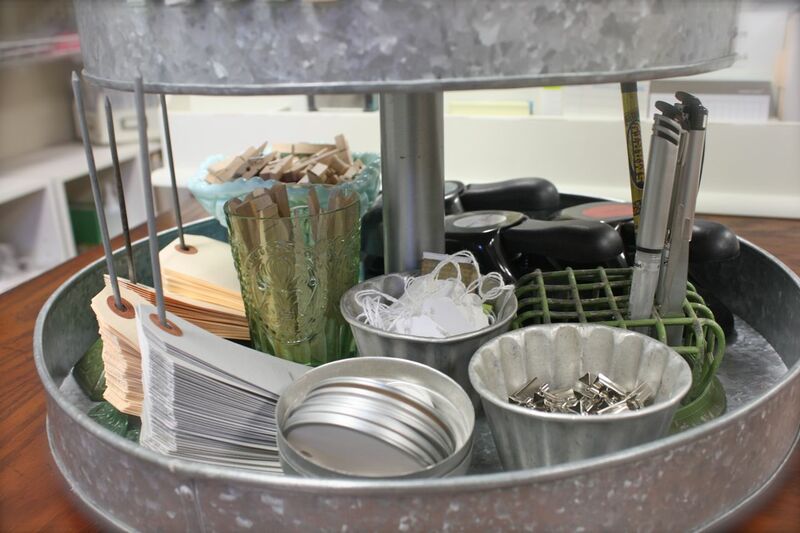 You could also check out stores like Ikea, Target, office supply stores, thrift shops, etc for storage ideas. I'll talk about each storage divider starting with the unit on the right. I love that both of the dividers are right in front of me when I work. Everything is in sight but just far enough back that I still have plenty of table space to work on projects and even lay out my fully opened Project Life album. 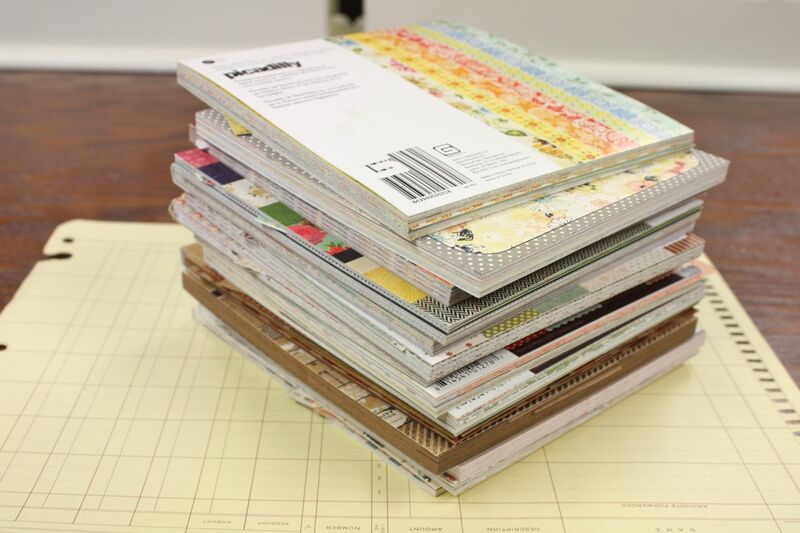 I consider my Project Life a work in progress and keep all my pocket pages in the albums while I work. The pages are usually flagged with sticky notes of what needs to be photographed and blogged....what photos need to be added..what supplies I want to use, etc. This divider unit is used for mostly my Project Life Core Kit components. 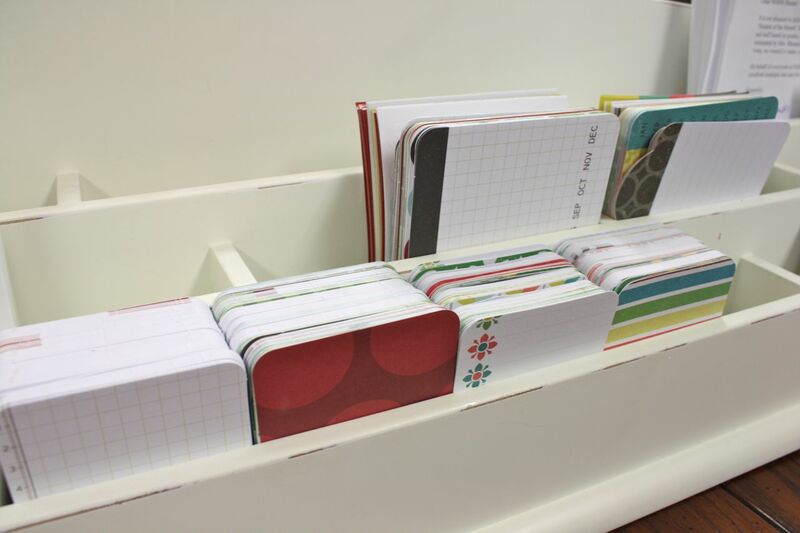 This includes all of the 4 x 6 Title Cards, 3 x 4 Filler Cards, 3 x 4 Journaling Cards and Blank 3 x 4 Journaling Cards. You can see examples of more of those cards if you click on the thumbnail photos at this link. All the components fit nicely into the divider slots as you can see below. 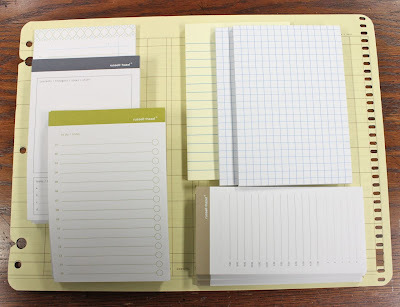 I just reach for a stack of cards and thumb through them each time I'm working on a Project Life layout. 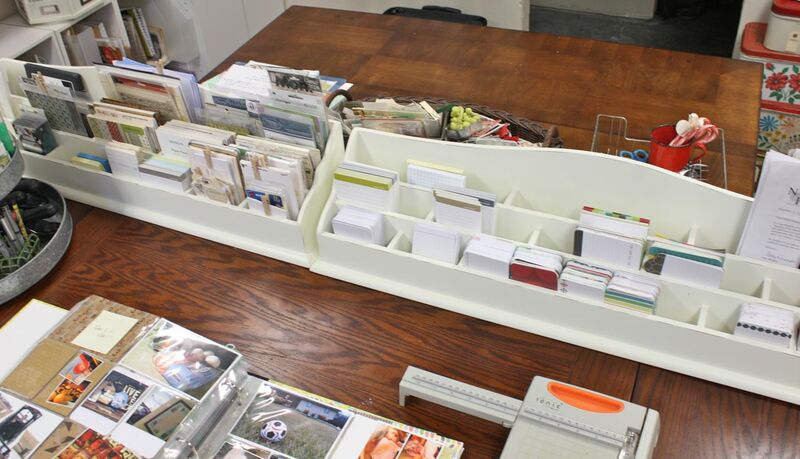 I've got a few other sticky type pads in this divider unit too. 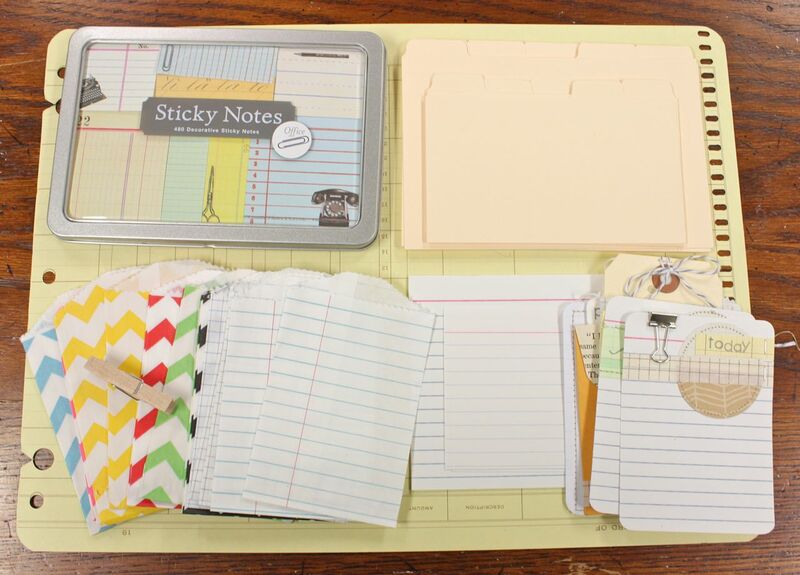 These include fun adhesive notes by Russel + Hazel and lined & gridded post-its from my local Staples office supply store. 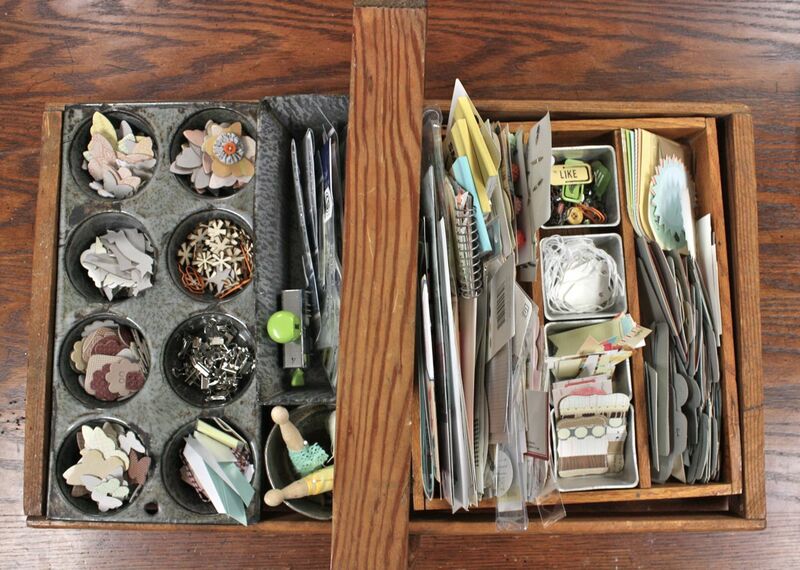 I use these both as organizing tools to mark pages, sketch ideas + as embellishments for my Project Life inserts. In the back of this divider unit I have a section that I use to safely keep papers and collected items such as the Pottery Barn bean bag tag, notes from school, Eric's nice speeding warning ticket(! ), miscellaneous photos and more. Kind of an in/out box of sorts. Here's the left side divider unit. This lines right up with the right side divider unit on my work table. 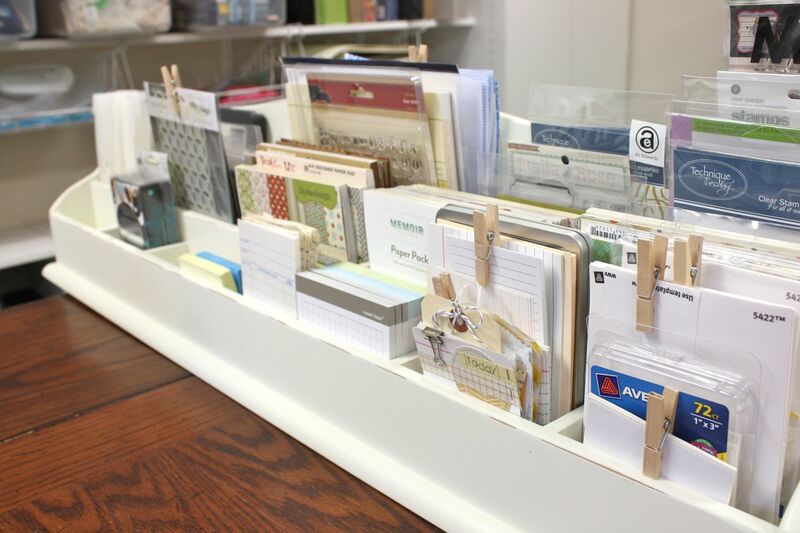 This unit holds a ton of paper type products + stamps + labels + papers and more. Again, all in easy view so that I can do a quick scan and be reminded of what supplies I have on hand. I'm a total visual crafter. I like to have my supplies nicely organized but out in plain sight. 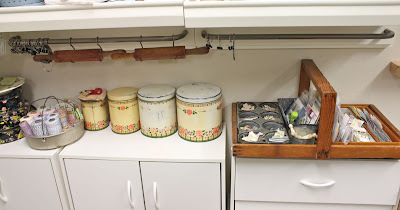 That's why open divider units like this one, wicker baskets, old wire locker baskets and vintage items like jello molds and bread tins work well for me. 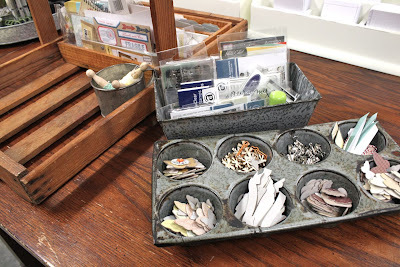 My organizational goal this year is to get rid of all things plastic-y in my craft space. I've photographed all of my favorite products that I use for Project Life. First up is labels, labels, labels. Check out this Project Life post to see how I love to use labels for journaling. Most of my labels come straight from my local office supply store or Walmart. You can run these through your printer, stamp on them or use them in a vintage typewriter which is what I do most of the time. Here I've got a fun tin of Sticky Notes from Cavallini & Co. + index card file dividers from my local office supply store + small Chevron, lined and grid sacks from my Etsy shop (more coming soon)(you can see an example of how I used the yellow Chevron sacks here) + a sampling of plain, lined index cards + some handmade journaling cards that I made from a recent kit I had in my shop. The best way to use these little items is to just look at what photos and colors you have available for a particular week's layout. Then shop your stash. See what coordinates, or get mixy matchy. That's the best part of having a stash of goodies available at all times. 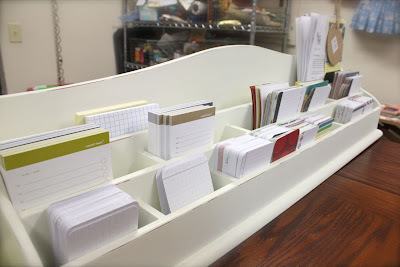 To keep all of my paper items in order but still in sight, I needed a way to keep them organized in small collections. I use simple Mini Clothespins and Small Clothespins. You could also use metal clips or paper clips too. Here I've got another stash of the Russel + Hazel sticky notes + some regular office supply sticky notes that I use to organize my weekly photos & journaling + some old library return cards that I got from Etsy. Check out my post on getting behind & getting caught up to see how I use my sticky notes to keep my Project Life weeks organized. 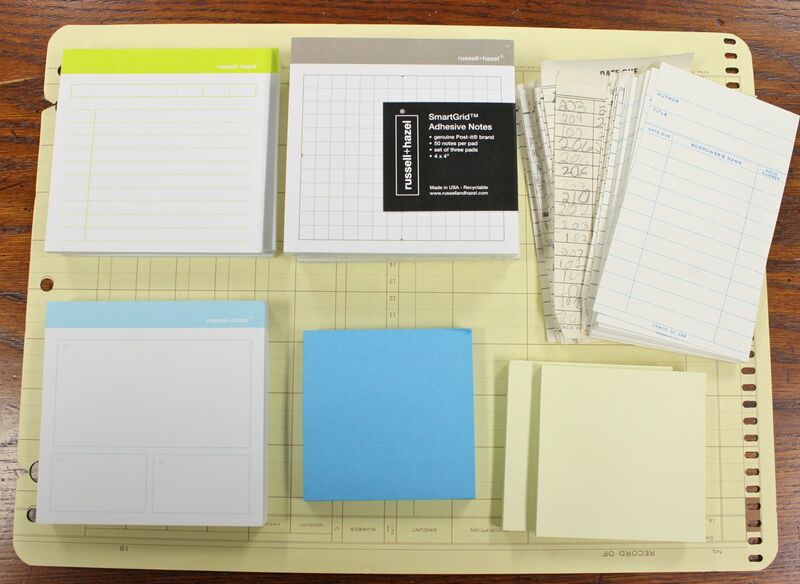 Sticky notes are my best friend when it comes to Project Life. On to patterned papers, one of my favorite supplies for scrapbooking. 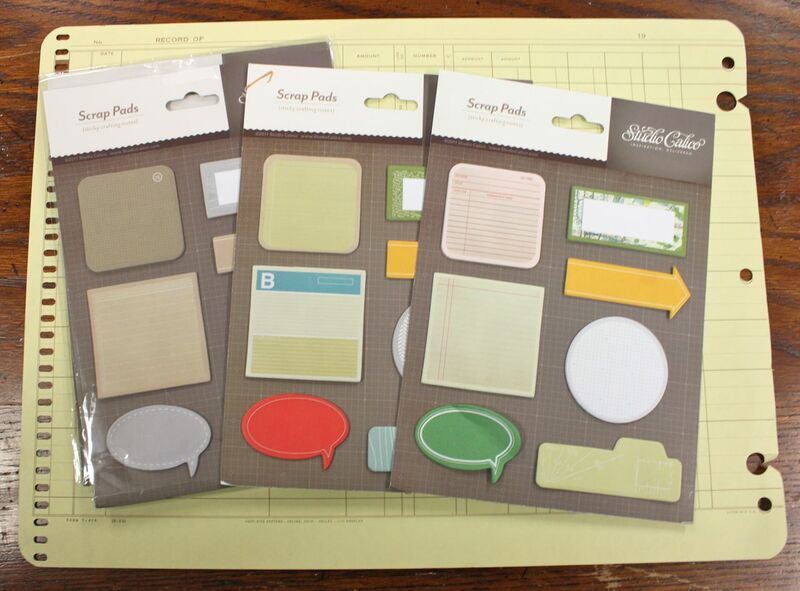 Recently I have begun purchasing 6 x 6 paper pads for my paper crafting. I purchase most of them here at Two Peas in a Bucket. Usually I just add a 6 x 6 pad to my shopping card whenever a new line of products come out that I like. I'll add in a few of the 12 x 12 sizes that I like too + chipboard elements, sticker sheets, alphabets, etc from a particular line that I like. Shopping from a collection of a particular line like My Minds Eye's Everyday Fun line gives you a nice little selection of coordinating items to use if you want to have a PL layout all mesh together like this layout. 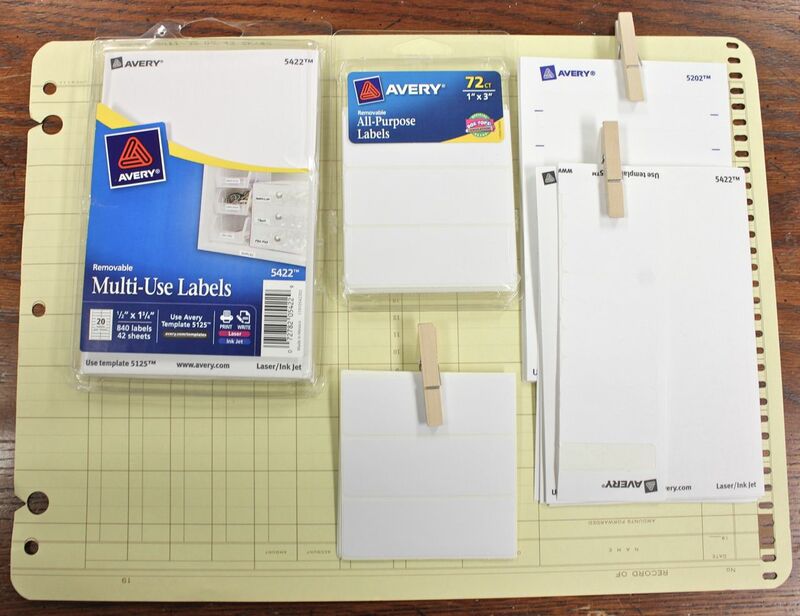 If you haven't purchased 6 x 6 paper pads before here's the scoop: The papers are usually 6 x 6 in size and are bound into a compact paper pad. 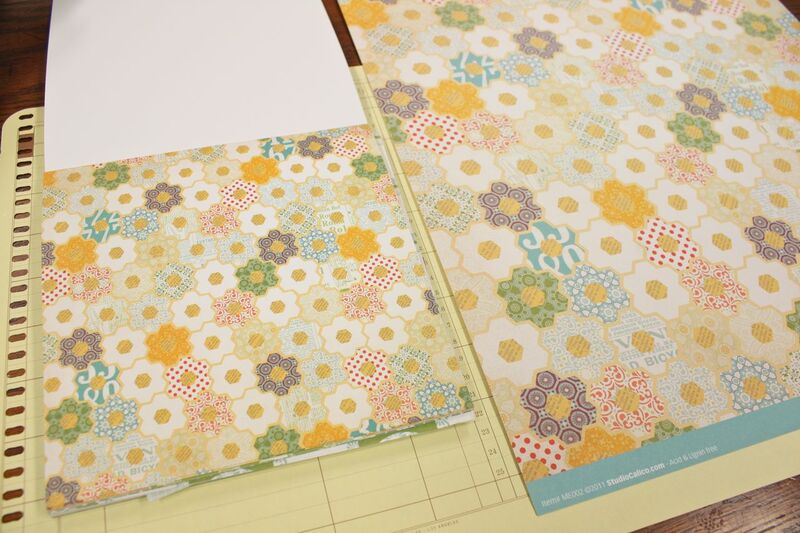 The pattern is a smaller scale compared to a 12 x 12 piece of patterned paper as you can see below. The pads are easy to store and I love the smaller scale for the small insert cards for Project Life. Here's some of my favorite lines of 6 x 6 paper pads. Picadilly from Basic Grey, although I don't see this particular 6 x6 pad listed at 2Peas right now. 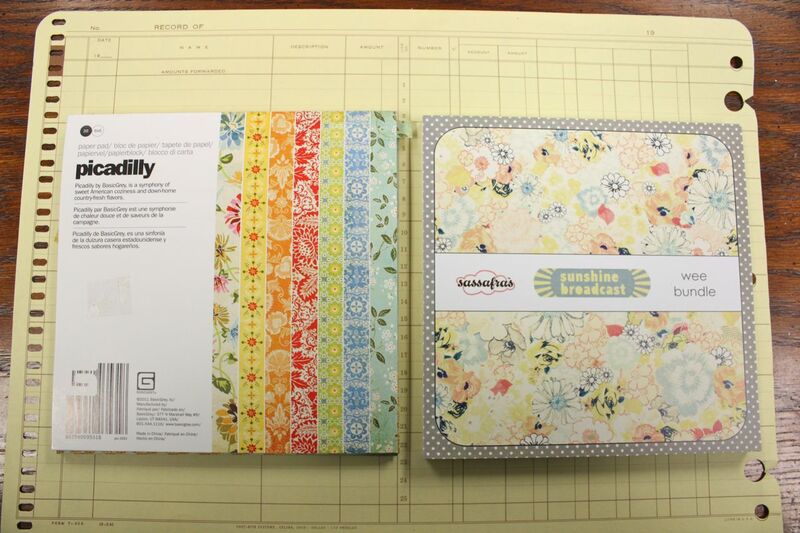 Sassafras Sunshine Broadcast, discontinued but you may be able to do a google search or find larger size papers if you like the line. 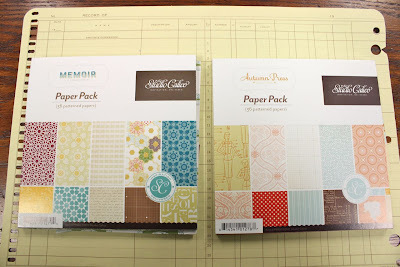 Studio Calico's papers which are available at 2Peas and the Studio Calico website. 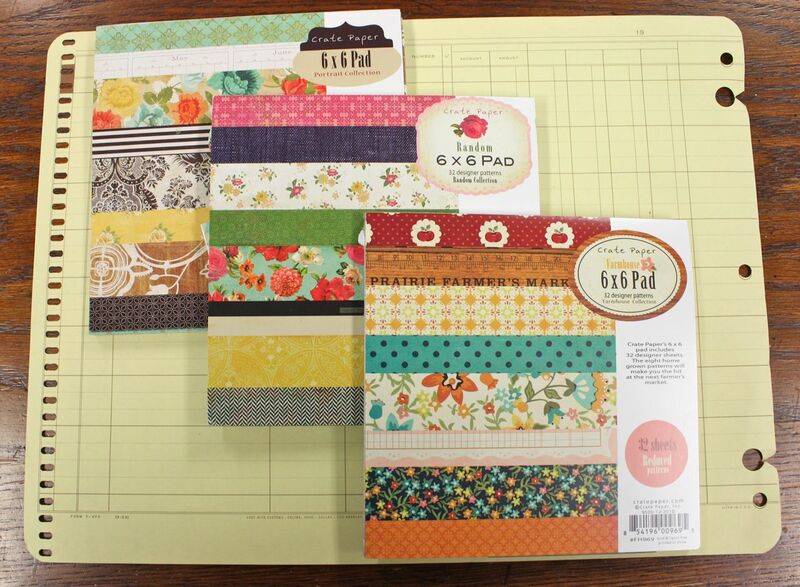 Currently there are 6 x 6 pads in the Autumn Press and Memoir . Studio Calico's papers give a great mixy matchy feel. 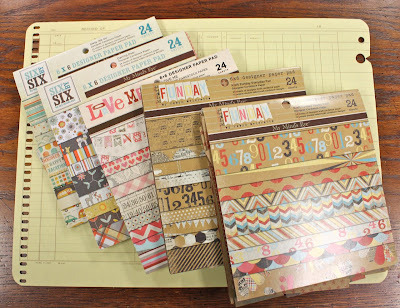 Crate Paper lines, some of my personal favorites offering wonderful collections of colorful and somewhat vintage looking papers. 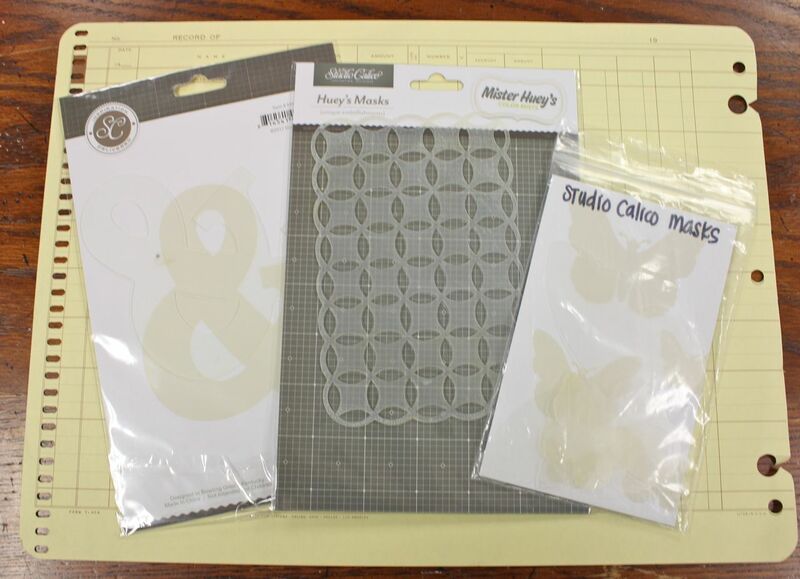 I often purchase 12 x 12 papers and coordinating embellishments from this company. 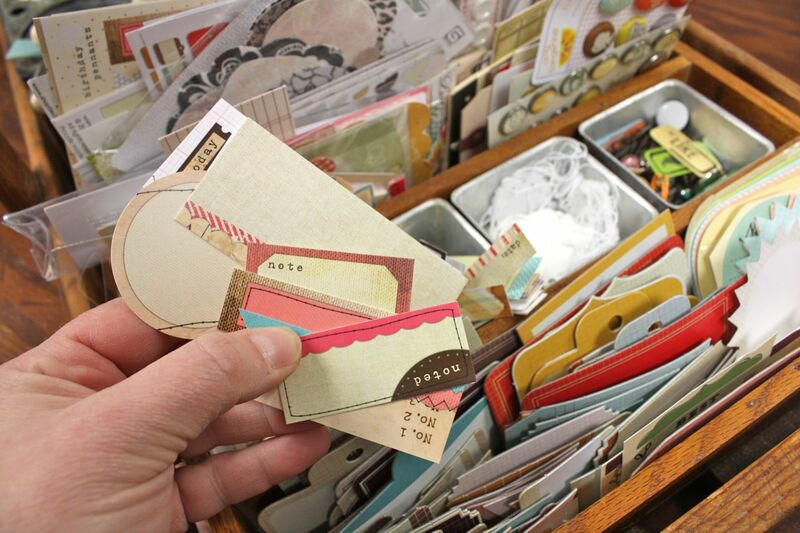 Lily Bee Designs papers, so colorful with a slightly distressed, worn look. I also love their Cardstock Sticker sheets. A whole lotta bang for your buck. One of my all time favorite companies, My Minds Eye. 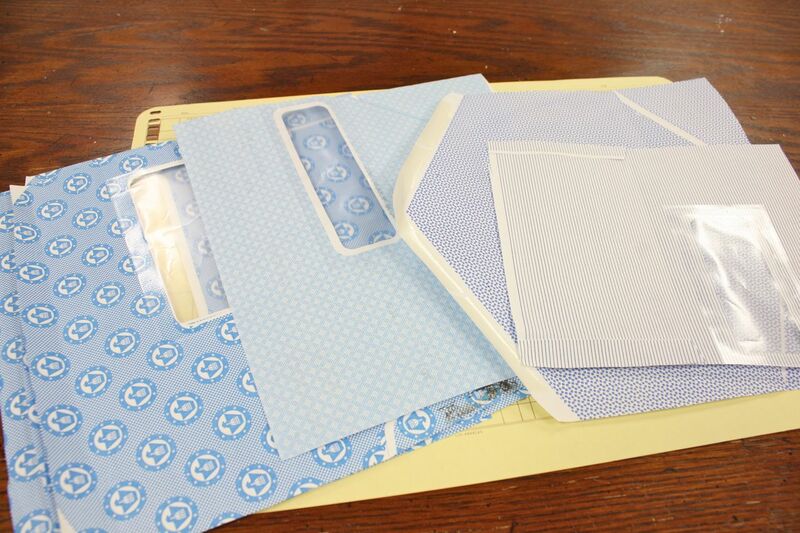 Oodles and oodles of papers and embellishments and coordinating stamps. Masks from Studio Calico. These are fun to use to create backgrounds using Studio Calico's Mister Huey spray mists. 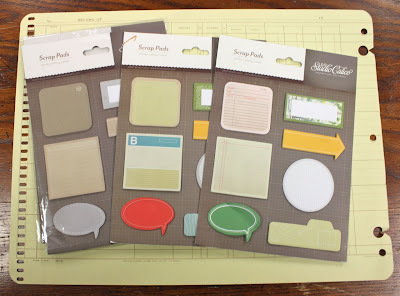 Little sticky notes called Scrap Pads from Studio Calico. There are currently 3 differently styles, Autumn Press, Memoir, and Classic Calico. 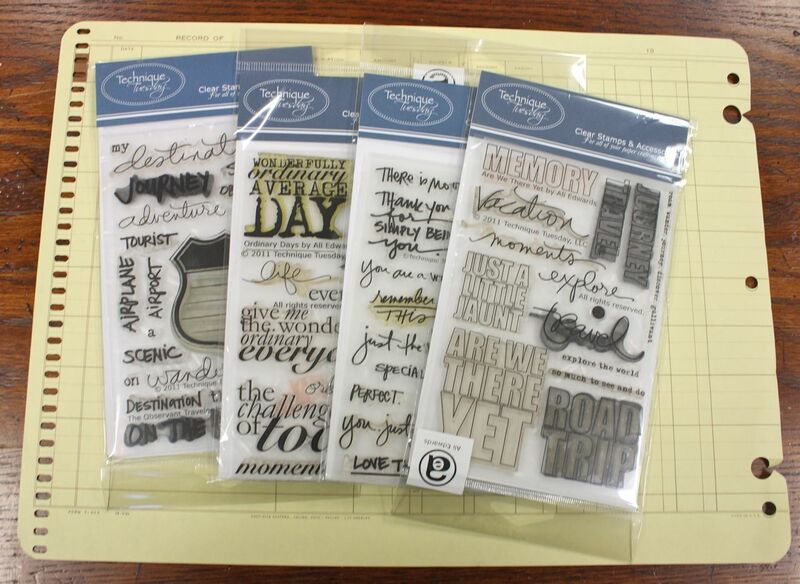 These are great to stick on journaling cards or use mini staples or machine stitching. I like to stick them to a piece of copy paper and run them through my vintage typewriter for journaling too. Look for them at 2Peas too. 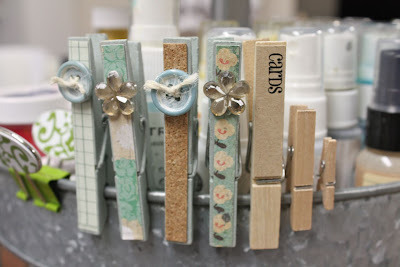 Again, I keep all these groupings organized with my little clothespins. Security envelopes from bank statements and bills. Kind of a weird thing to keep but I love the patterns on the insides of the envelopes. 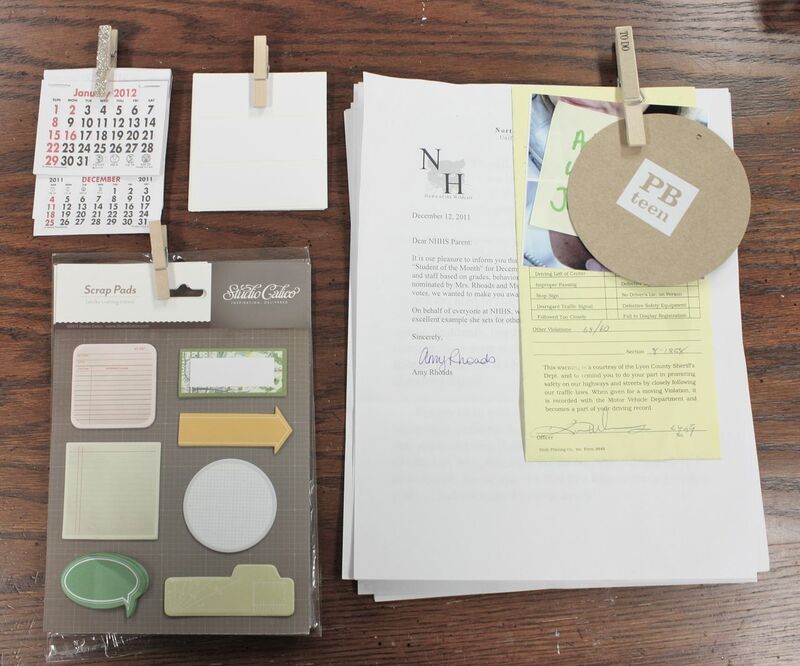 If you like to get scrappy with your Project Life, you'll be amazed at the new way you look at junk mail, catalogs, mailings, product packaging and more. Fun little items you can die cut, punch, etc. With that said, just be careful to not collect too much stuff. Stamps! 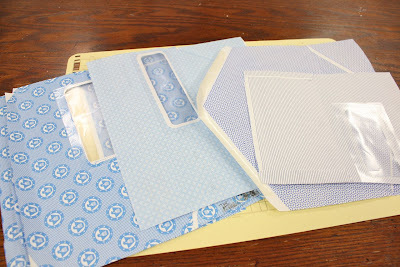 I am an avid stamper of cards so it's natural that my stamping would carry over to my scrapbooking. 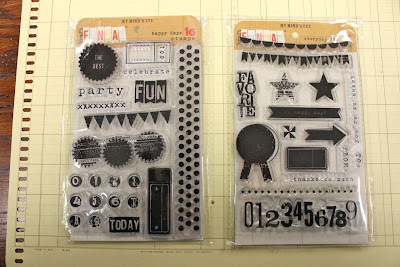 I really love Ali Edwards' line of stamps from Technique Tuesday. 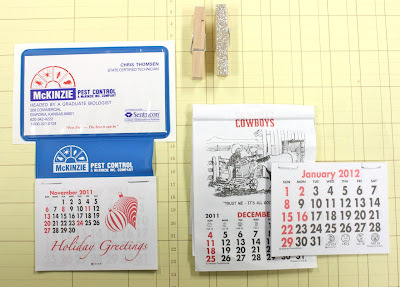 You can purchase Ali's stamps directly from the Technique Tuesday site or look for them at other online sites like 2Peas. My Minds Eye has 2 fun stamp sets out that I've been using a lot too. 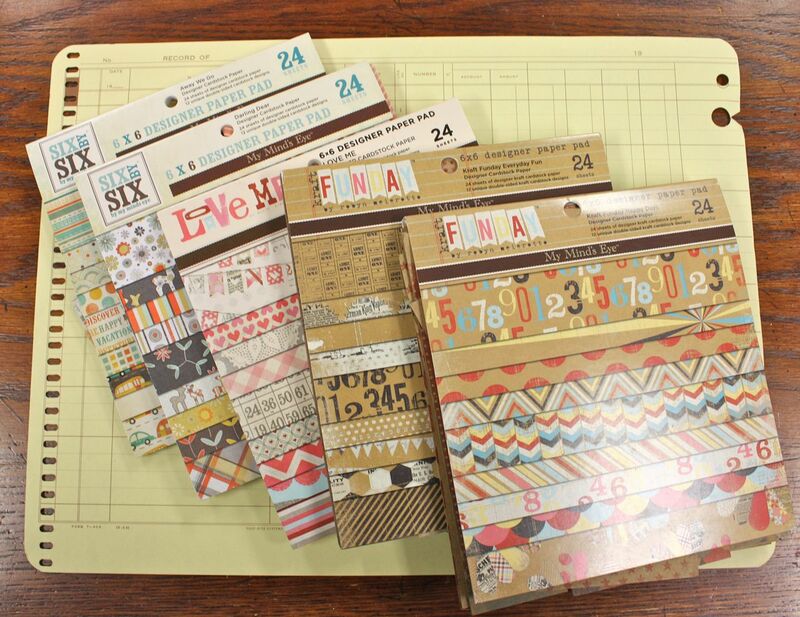 Jenni Bowlin has a fun Days Of The Week stamp set that is fun for making big and bold journaling cards. These are big, like 3" wide. 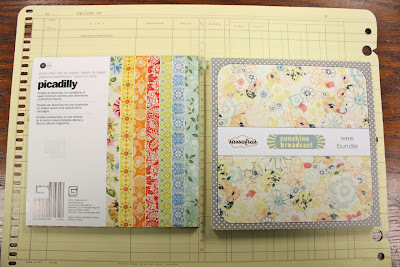 My Papertrey Ink stamps also get good use in my Project Life albums. I keep these in a separate cabinet nearby and reach for them as needed. 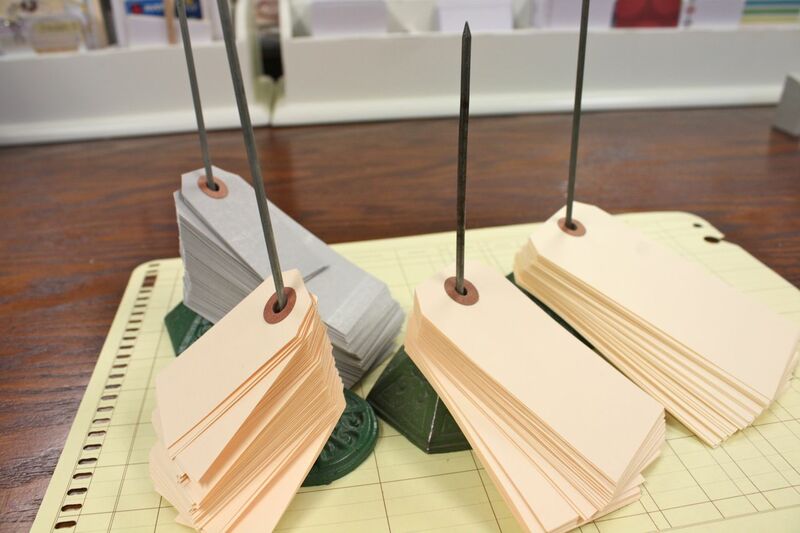 There are lots of categories to choose from such as these Labels that have coordinating die cuts. The tags would be great to use on PL pages too. 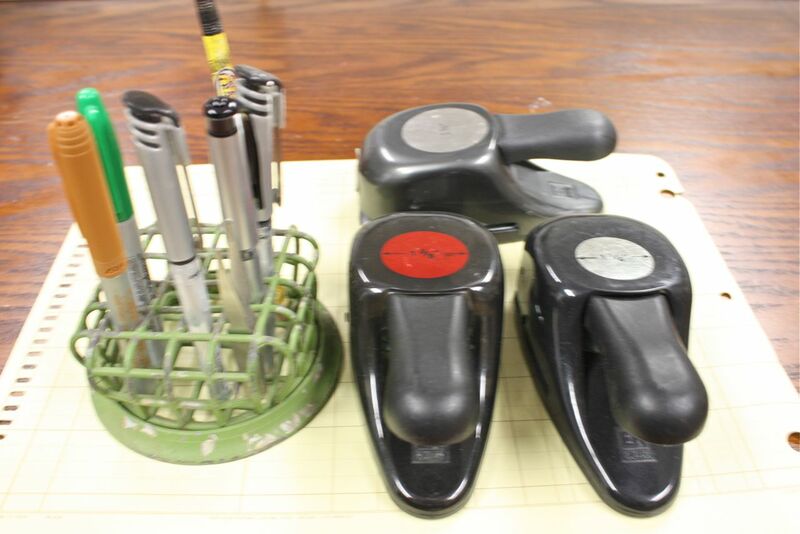 Most of the circles can be punched with a 1-3/4" circle punch. 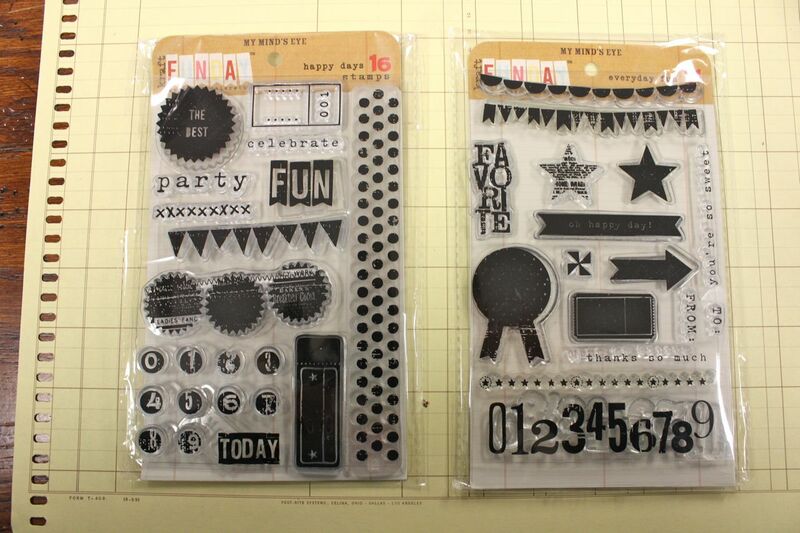 The background stamps can be used to create virtually any pattern you desire. 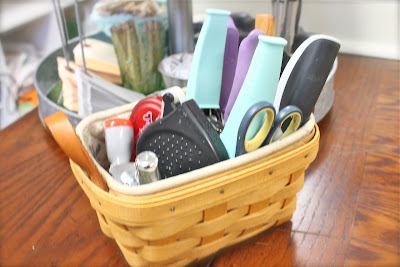 I think it's a great idea to keep a small basket that houses your most used tools. Tools you reach for almost every time you scrapbook. My little basket is from Longaberger and sits on my work table at all time. 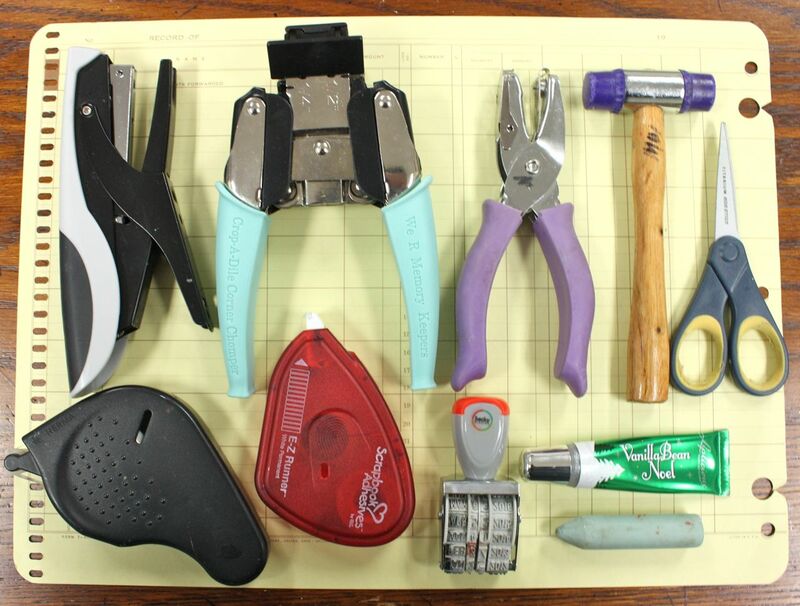 The contents of my basket include my Tiny Attacher, We R Memory Keeprs Corner Chomper Tool, 1/16th hole punch, hammer, scissors, adhesive, date stamp, eraser tool and lip gloss. 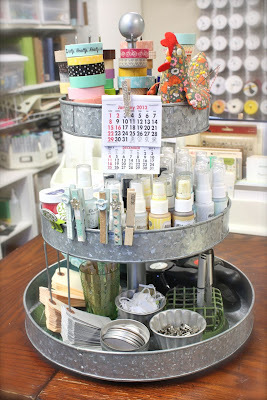 This galvanized metal 3-tier stand from Pottery Barn is a favorite storage item in my craft room. It totally works with my *out in the open* method of storage. And going vertical is a great way to add storage to your crafting space. Whether it's stacking units, bins, baskets or shelves...use that vertical space to utilize more of your craft space real estate. 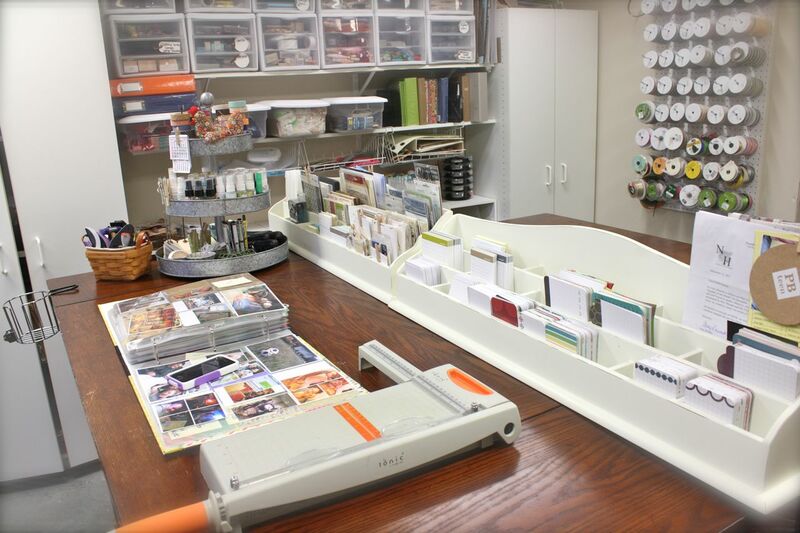 My 3-tier unit houses a variety of supplies that I use not only for Project Life but for my crafting projects in general. 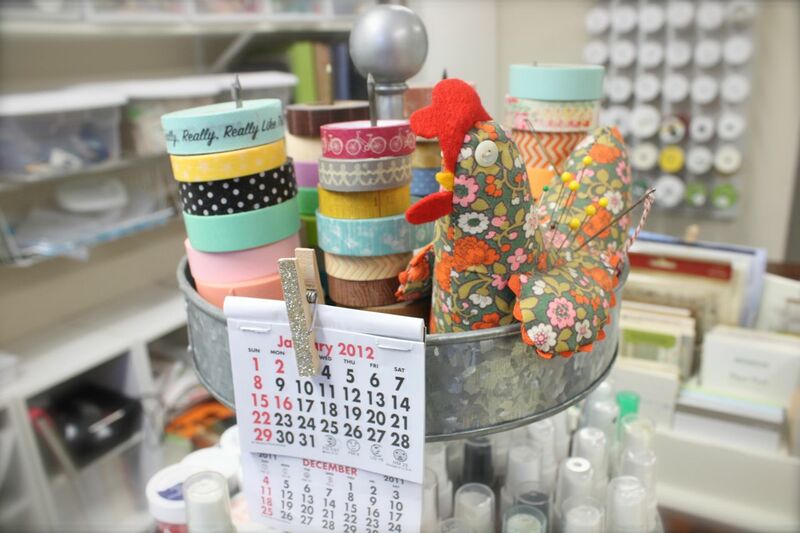 The little chicken is a vintage pincushion that I found at my local thrift shop. I keep a small calendar clipped to my 3-tier unit so I can have it handy at all times. The small size is perfect for referring to dates of a particular week and when using my date stamp to create journaling cards. 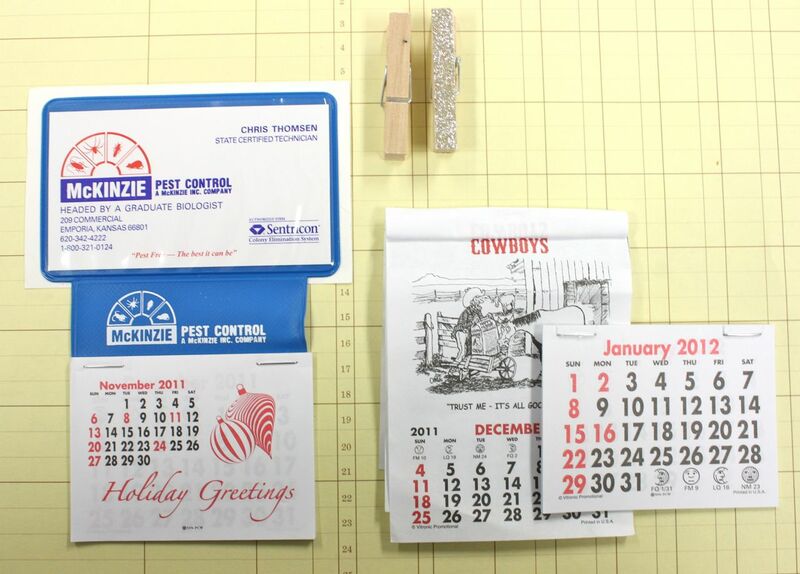 You can find these small calendars at various business or banks that hand them out as freebie promotional items. I tear off the advertising and use just the calendar. Check out this post to see my calendar system that utilizes a bigger day planner type calendar. 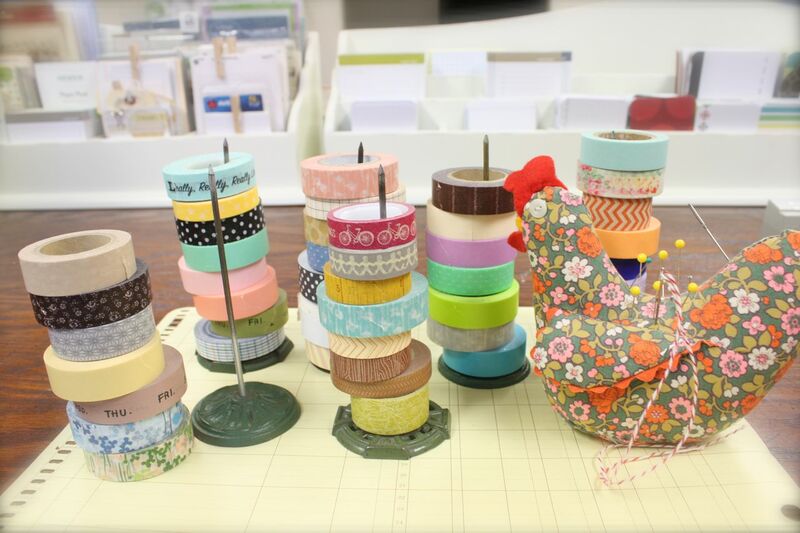 Also in the top of my 3-tier unit is my growing collection of Washi tapes. Washi tapes, or Japenese masking tapes, are opaque tapes from from rice paper. They are tacky but can be removed easily so they're pretty forgiving. Most of the ones you see below are from Pretty Tape. You can see my tapes in action in this week of Project Life. To store my tapes I use vintage receipt spikes. I found these various spikes from Etsy, local thrift shops and Ebay. In the middle tier of my galvanized unit I keep sprays, paints, and powders. Very easy to reach and see what colors I want to use. 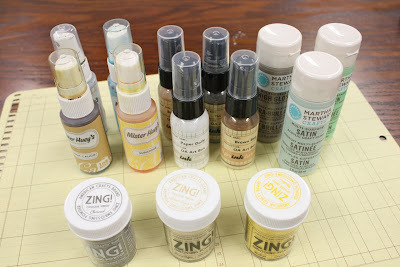 Here I have a fun collection of Studio Calico Mister Huey mists, October Afternoon Sprinklers, and Zing embossing powders. I also have a small collection of Martha Stewart paints from Michaels. 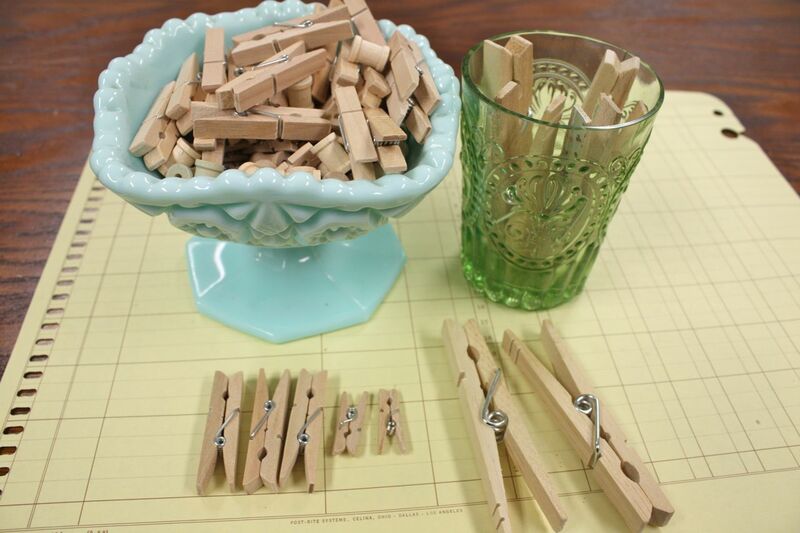 I have this thing for clothespins. Tiny, small, big, plain, embellished...I love 'em. I keep a fun collection clipped to my 3-tier unit. I use these to clip together anything in small collections. In the bottom of my 3-tier unit, I keep a scattering of supplies that I reach for often. Vintage jello molds are a favorite of mine for storing small embellishments like clips, tags, and buttons. This vintage flower frog is perfect for storing pens and markers that I use for journaling. Circle punches are used quite often so they stay close by. Here I've used more of the vintage receipt spikes to hold tags that I use for Project Life journaling cards, packaging and cards. Tags are just a staple item that I use all the time. Here I have a vintage, aqua candy dish that holds mini clothespins and mini wooden spools + a small tumbler from Anthropologie that holds larger clothespins. 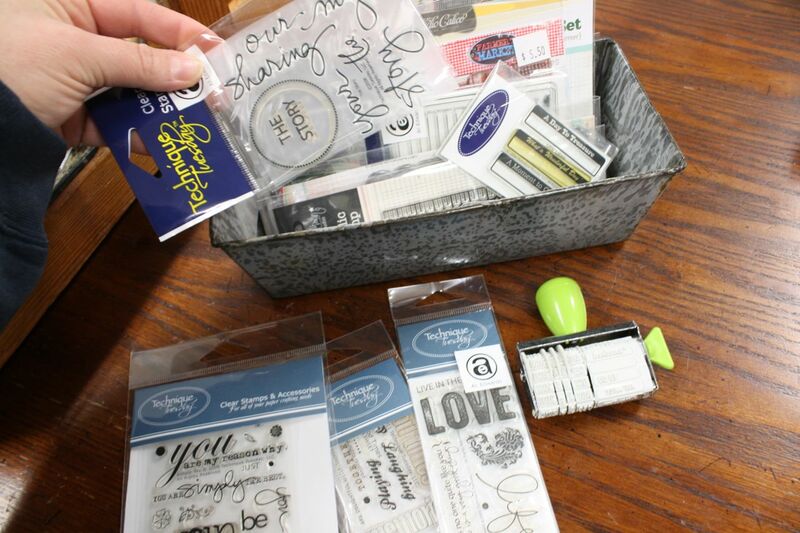 I also love to use Sharpies and Bic Mark-its for journaling in my Project Life. You can find both brands of markers at Walmart or your local office supply store. 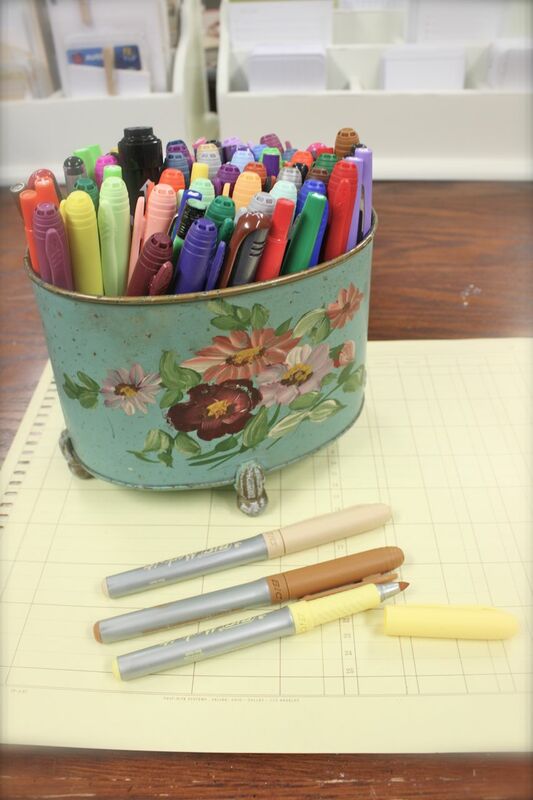 The container for my markers is a wonderful vintage find from a local thrift shop. Here's a Project Life week where you can see my markers in action. I have an additional storage piece that can be easily moved to my work table when I need it. This wall is directly behind my Project Life work table. The storage piece is a vintage wooden tray that is made from canteloupe boxes, I believe. I bought it at a local antique shop because it was just too cute to pass up. Here's the top view of my tray. 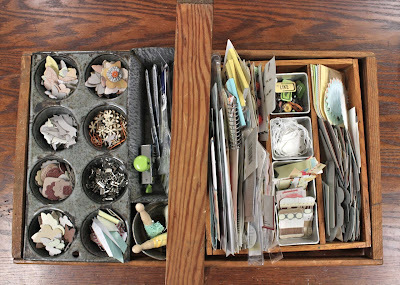 Another mish mash of sorts but all the supplies are neatly tucked into even smaller storage pieces inside the tray. On one side of the tray I keep all of my Elle's Studio paper goodies tucked into a wooden divider that came with the tray + some smaller vintage jello molds. Elle has a wonderful selection of printed paper die cuts that are perfect for journaling cards. I use them all the time + they show up often in many of my Etsy kits. I also keep my Studio Calico chipboard pieces + brads, Smash items, tags and misc items in the little tins. On the other side, I discovered that my prized enamel bread pan and muffin pan nestle into the wood tray perfectly. If space is cramped I can take out the little storage pieces and keep them on my table. 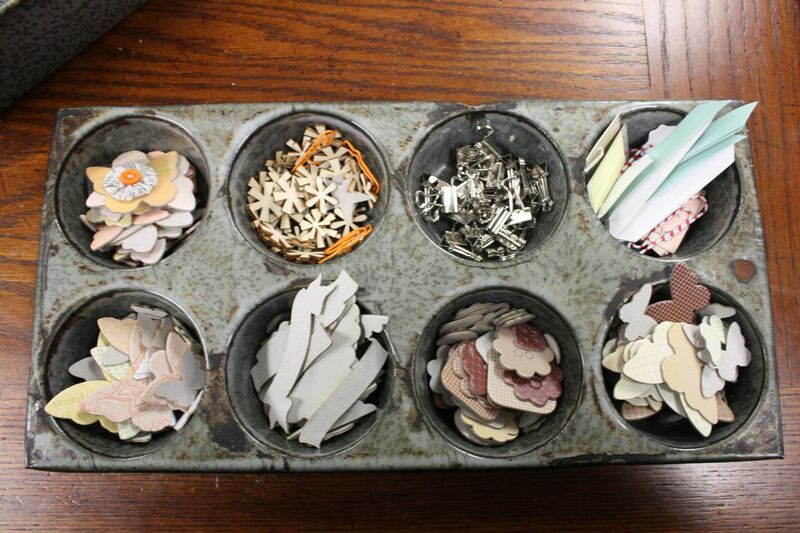 The muffin tin holds more Studio Calico chipboard pieces, metal clips, more Smash items and wooden embellishments. The bread tin holds more small stamps and a Smash date stamp. My vintage typewriter is my special little aqua colored cutie of my craft room. A friend of mine called me one day from Good Will and asked if I wanted this vintage typewriter. She knew I was looking for one....who knew she'd find the perfect color! 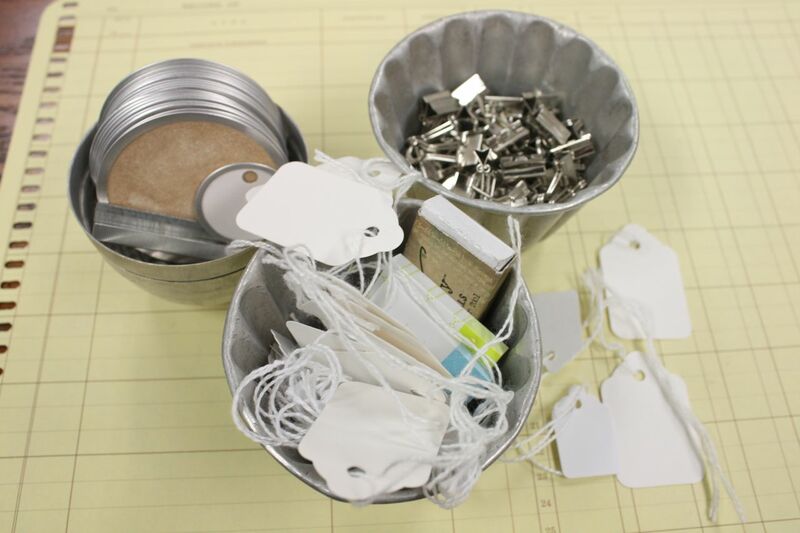 I purchased a new typewriter ribbon from Staples and to re-thread it onto the existing spools. Messy and inky but oh so worth the trouble. 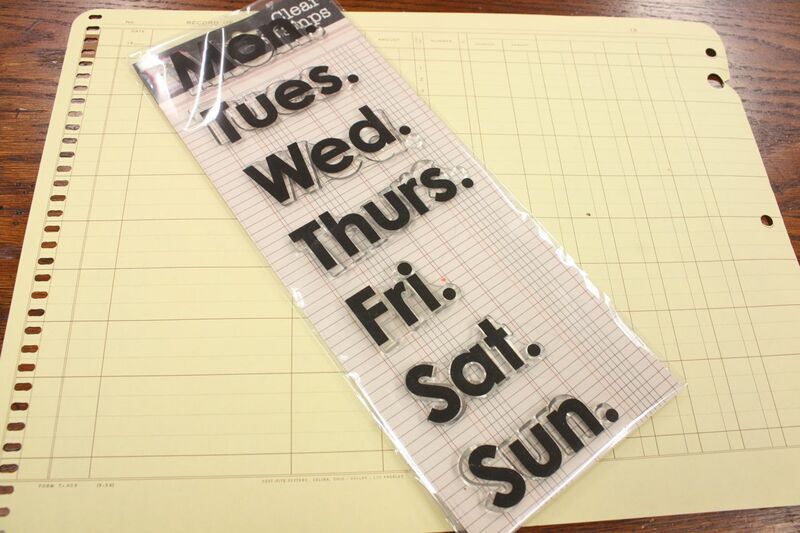 I use this for typing directly onto journaling cards, tags, sticky notes, stickers and more. If you're looking for one, I would scope out garage sales, antique shops, and thrift stores. About $20 bucks is a good deal around here. Mine sits on a vintage typewriter stand that has fold out surfaces. This tucks right under my table and I pull it out when I need to use it. And this concludes the tour of my Project Life work space. I'm happy to answer any questions you leave in the comments section. I'll be adding this post to my Project Life Topics Page which is located at the top left hand corner of my blog. At this link you'll find my informational Project Life posts linked in one spot. 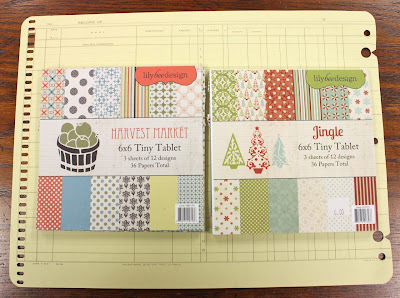 For my actual Project Life weekly layouts, you can visit the "Labels" section of my blog on the left side and click on the labels "Project Life 2011" for last year's post and "Project Life 2012" for all of this years posts. All of my posts will be listed in the order they were posted. If you're looking to get your supplies collected & organized, I hope I've given you a few ideas to toss around. I have a board on Pinterest dedicated to Project Life Inspiration that you can check too. Also, be sure to check out Lisa Truesdell's awesome blog post on how she makes Project Life work for her. Marcy Penner also did a fun series of blog posts on how she organizes her Project Life. Whew. My fingers are cramped now so it's time to wrap it up. Here's to a great year with Project Life. Good luck, don't stress, dedicate time and most of all.....have fun preserving your wonderful memories! Check back often for more Project Life updates and informational posts. 1. I'm not sure about the acid content in the Sharpies but the Markits site said "no added acid; no measurable PH". 2. The Pottery Barn 3-tier unit does not have a rotating base available. If you found a lazy susan big enough I suppose you could sit the unit on it so it would spin. I don't mind just reaching around for what supply item I need though. 3. You can check the ways to add my blog to your feed at the left of my blog on the sidebar. At this time, I don't have an email subscription available. I love your workspace! I so wish that I could have one like that. I am so ready to start my Project Life this year. 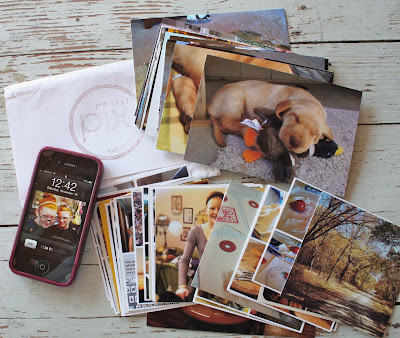 I have never really been good at scrapbooks but I know I can do this! Thanks for sharing your space. I love that there is someone else out there that seems to use clothespins as much as I do. My mom used them for everything growing up and I seem to use them even more. They are so incredibly handy. 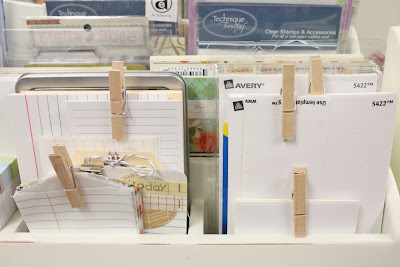 I have "lines" of hung cards around my craft room on every wall and use them for all household stuff in addition to scrapbooking and crafts. Oh!I am wanting to make your organizers though. Mine are smaller sized ones but these would be just perfect! Love it. Ok - I totally want to move in!! 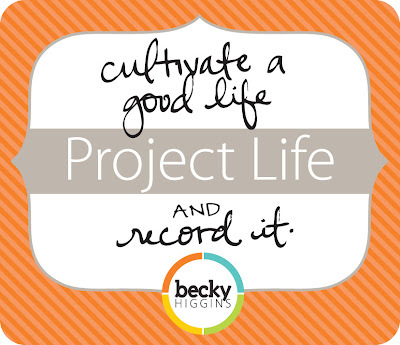 Can't wait to follow along with you for Project Life - this is my first year! WOW ~ the amount of info you just gave me is just WOW!!! Your workspace is one of the most amazing that I have ever seen! I wish I had the room to have something even similar to yours! Great post... so worth the wait! Thanks for taking the time to photograph all the parts and pieces and explain your system! Thank you so much for the time and effort you spent on this post. I am learning a lot and taking mental notes :). I did get Diptic based on your recommendation and I really like it! Love this post! Thanks for the amazing post! Wow...thanks for taking the time to write up this amazing post!!! I loved every word!! I'm already for 2012!!! Very exciting! Oh this was so fun Michelle! I love seeing how others organize and where they create! Thanks for sharing and Happy New Year! Great post. TFS! I loved to see how you have incorporated some traditional office supplies with your scrap supplies for doing PL. 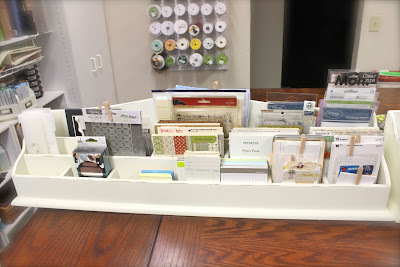 Fabulous ideas - love the tapes and your storage in vintage molds... 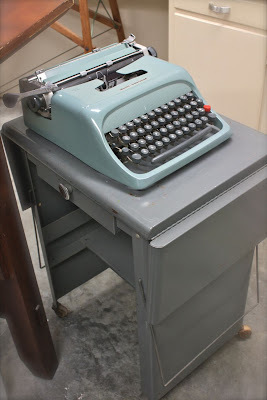 BUT the best one is buying the typewriter ribbon and respooling it - I've always wanted an old typewriter to use but figured I should not bother because how would I get the ink ribbon for it... Thanks for the tip - I am now on the HUNT! Happy New Year! 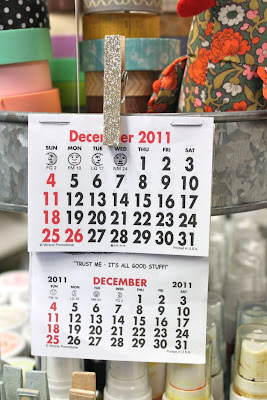 I have enjoyed visiting your blog for several years and look forward to seeing what you have in store for 2012! Mish, I am so thrilled you are on the PL team. I'm a HUGE follower of your blog when you and always love the tutorials, sketches, peek into your studio posts you do. 2011 was the first year of doing Project Life, but I already took 3 pictures for 2012 and need to do my journal card to go with them. Thanks for sharing! What an incredible post! Thanks for taking the time to share all that with us. 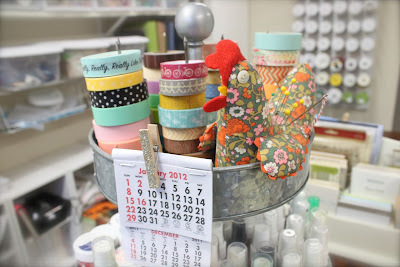 I so wish I could get my workspace to look that organized --then perhaps I could finish up on Project Life 2011! 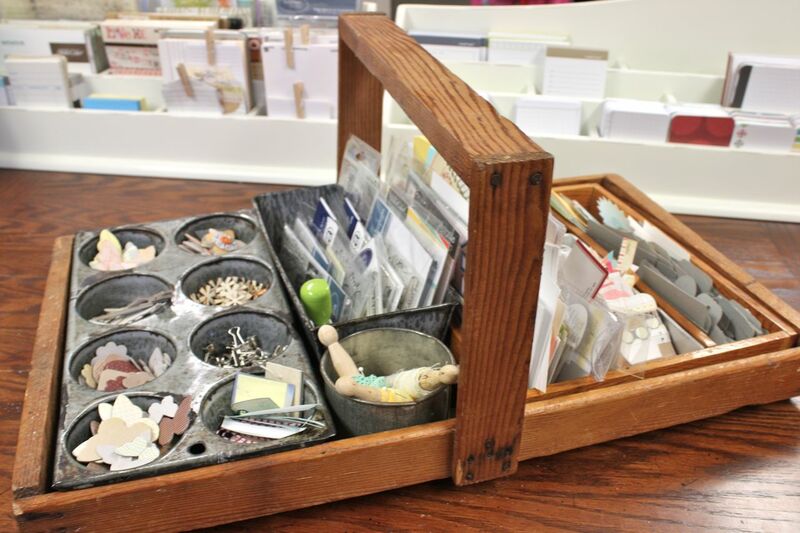 I love the Pottery Barn Organizers, so I'll have to see if I can find something similar or have hubby make some. Happy 2012! Wow! You are so organized. I love all your creative ideas too. Your blog is the first place I stop when I need an idea. Thanks for all the great ideas. I need to 'see' my stuff, too. LOVE LOVE LOVE your typewriter, want to find one of my own. Totally awesome!! Thanks for sharing. I have new inspiration to start my second year and not do the same old thing!! Wonderful inspirational post. 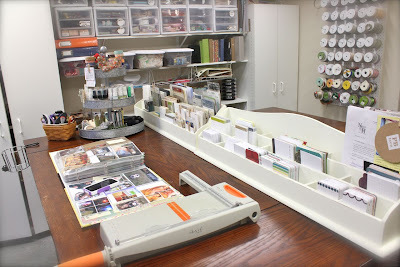 As I'm in the middle of tidying up my craft room I loved everything about this post. PLO, You make is look so easy, I'm going to give it a try this year. Happy New Year to you and all your family. Thank you SO much!! I am now very inspired to continue organizing my crazy collections of crafts that never get used because they are so unorganized. Can't wait to see what you do with Project Life this year!!! What a great post..Thanks for sharing!!!! This will be my first year with PL & I will now be looking at some everyday things alot differently! Very inspiring photos. I love that Pottery Barn 3 tier piece...does it come with a little rotating device on the bottom or did you have to buy a separate piece for that? OMG, this much have taken so much time for you to put together this post. Thanks so much for sharing your crafting area and ideas. You're so inspirational. Michelle thank you for sharing your experience in organizing and favorite Products. I've long been following your blog and on board pinterest. 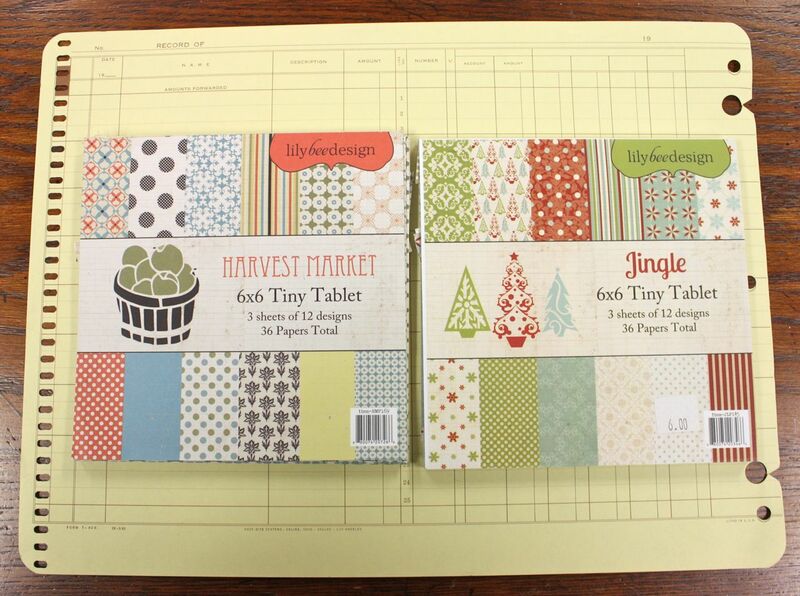 This year I decided to order a Project Life Kit. I love Clementine Edition! So soon Project Life will come to Russia! I love those PB dividers - so sad that they aren't available anymore. Thanks for such a great post! That was fun to look at. Thanks for sharing some great ideas . WOW!! Such an amazing post an dI appreciate you taking the time to post everything including the links. I have Pinned this post to my Project Life board. Thank you for being an inspiration!! Wow--thanks ever so much for sharing. I know that post took you a long time to put together, but I really really appreciate the tips. <3 So awesome. I'm doing PL for the first time this year after watching yours. . . miss you and love ya bunches! Thanks for sharing. I was wondering are the sharpies and bic mark it's acid free? just a thought. Thanks for sharing all your awesome storage ideas and such! so much good info! thank you!!! Wow, I love your Work Space, so cute, so organized. Thanks for your post, you inspire me. One of my proyects for 2012 will be organize my space and decorate it. I need it. Thanks and Happy New Year. Beautiful! Could you come and sort my craft room out?! 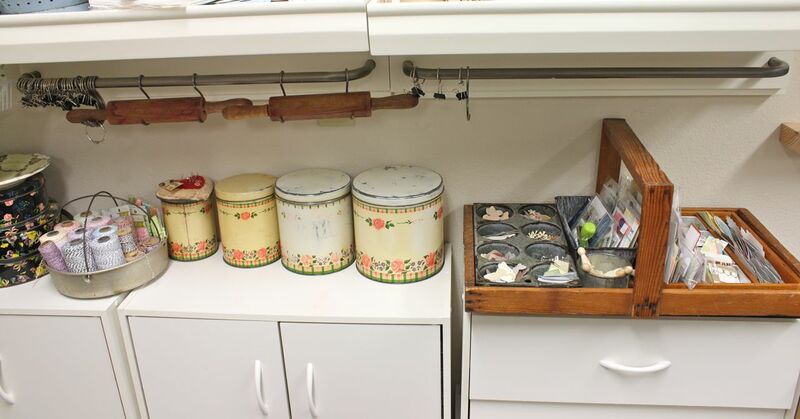 What do you use the two rolling pins for? What a wonderful space! thanks for sharing all of your super inspiring ideas! I am starting PL for the first time this and you have given me lots of great ideas. I love how organized your work space is! This is a wonderful and amazing post! I'm inspired to better organize my space! *SWOON* this is like my dream workspace!!!! That's it! I'm coming to live with you! Thanks so much for the fantastic detail - just amazing. Michelle, thank you so much for taking the time to share your wonderful PL work station with us! I'm a HUGE fan of your work having been following your blog for several years now. I very much enjoy reading about your crafty adventures, your two "reds," and your vintage finds! I have embarked on the PL journey this year and am using it to document my life in the form of a picture a day. I'm so glad I have your blog to turn to for inspiration and motivation. I am so excited!! Wow! Thank you not only for the text but for all of the wonderful visuals. Such an inspiring space and your space is one that you've made so unique and that is also practical because it meets your needs. 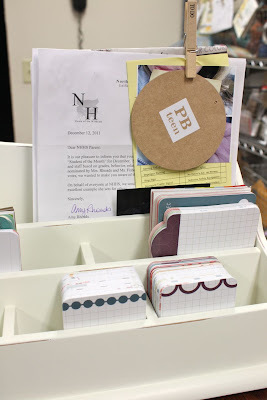 I will be adding your blog to my Google Reader & found you thanks to the Becky Higgins! Also love the Pinterest inspiration. Will go through that now too! I've been kind of lost with organizing my scrap space since a downsizing move, a little sad and mostly just not having a vision. Someone teased me about keeping my sprays in a closet and I said it was so normal to jump and get something that I no longer used a chair - I love your space, and thank you for taking the time to share it with us. I now have a vision and a purpose. Oh, so many wonderful ideas!! 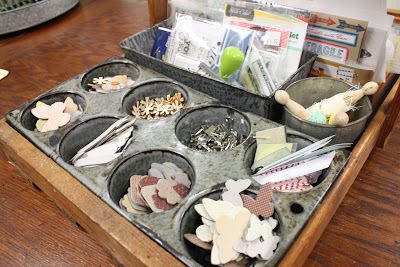 I want to reorganize my craft space NOW!!! Thanks for sharing your space with us! This is my second year with Porject Life and I'm looking to go a different direction with some scrapbooking. You have helped me a lot!! Wow! thanks for sharing so many great ideas! I am also trying to de-plasticize my craft room, so I'm curious to see what you come up with! Your wooden tray made from a cantaloupe crate is called a berry basket I believe. It's meant to hold the old wooden or green pulp berry pints in them. I've seen them on etsy recently. wish I had all the ones from my grandparents farm LOL I could make a small fortune. They aren't cheap! Very simple to make though if you want one to fit your own storage items line the muffin pan or bread pan. Thanks for your response on the sharpies. They have 12 count variety packs at Staples this week for $3 for fine and ultra fine. OMG your workspace is just great! And all the tools, papers, ribbons ets... I wish I had only the half of the whole staff you have! This was an amazing post. Not just for people doing Project Life or scapbookers, but for those card makers looking for a new way to organize or stay inspired. I love how you have your space set up and always love it when you share your creative space and how you do your process for creating. Thank you for this post. OH MY!! Michelle, this is just what I needed! You have some totally awesome ideas for storing everything! I am smack in the middle of doing this in my space and this is just what I needed, so thank you so much for sharing!! Lots of great information in this post, thank you for sharing it all. 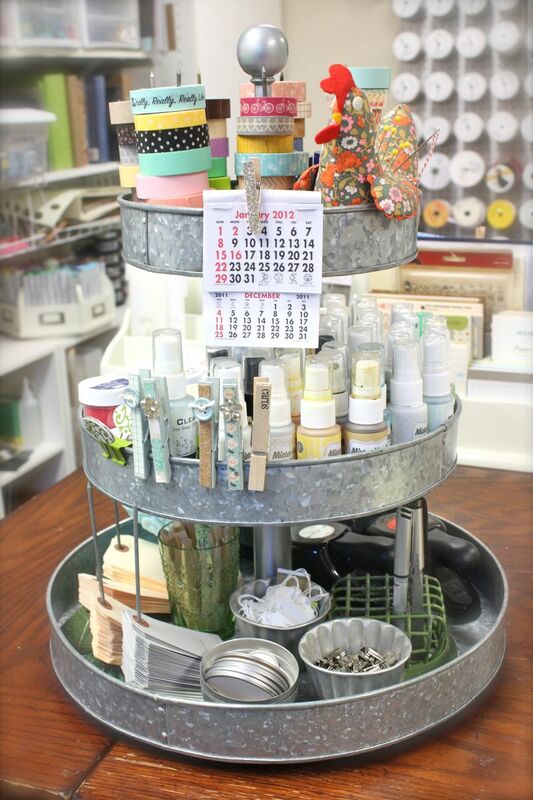 Some of organizational ideas just make me happy and excited to try them out. I tried PL last year, got overwhelmed and gave up, your calendar idea is going to get me across the finish line in 2012.
nice post. Now you can use this exporters directory directory to promote adhesives products import & export business.